The city’ urban shelter agency DUSIB’s report on how to make the city slum-free is a challenge for any government, especially one elected on a pro-poor agenda. With the Aam Aadmi Party government firmly in place to rule Delhi for the next five years, Delhi’s slum-dwellers may have a legitimate concern of fading into the background as the election season is over and a new one is far away. However, Chief Minister Arvind Kejriwal said in the Assembly last month that his government has no problem with being labelled the “government of the poor”. So if his administration is looking to cement its pro-poor credentials, it can have a good look at a recent report by one of Delhi’s top housing agencies for leads on what to do for slums. The Delhi Urban Shelter Improvement Board (DUSIB) has submitted a voluminous slum-free city action plan (SFCAP) to Delhi government for approval. While the board has proposed various measures to rehabilitate Delhi’s slum-dwellers, one of the main objectives is improve sanitation facilities available to the slum population, apart from freeing up nearly 200 hectares of land. With over 22 per cent of the population in Delhi’s slums without access to a toilet, it is critical that the administration acts swiftly on the proposed plan, if found feasible. The DUSIB plan will take at least six years to be implemented, subject to being approved by the Delhi government and subsequently by the Union Ministry of Urban Development. The data that the board collected in order to prepare a housing strategy for the slums, however, reveals the grim reality of inadequate sanitation. Poor sanitation, in addition to depriving slum-dwellers of their dignity, also poses the perennial risk of exposing the residents to infections and diseases. 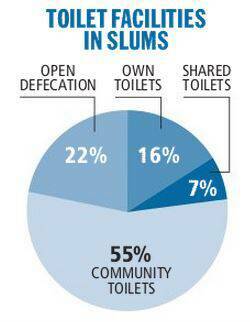 The SFCAP shows that 56,980 households in the city’s slums still defecate in the open. The numbers, apart from being the “ugliest” situation that bring “shame” to the country’s capital, as stated in the SFCAP, also throw up a formidable challenge before its administration. According to the data mentioned in the SFCAP finalised by the DUSIB in February, 22.30 per cent of the 2,55,435 households living in 589 surveyed jhuggi-jhopri (JJ) clusters in Delhi defecate in the open. “Sufficient arrangement needs to be carried out for totally liquidating such type of practice,” the SFCAP states. The data cited in the plan is based on the socio-economic survey of 2012. It showed that 16 per cent of the population living in slums has a toilet within their residential premises. The figures also indicate that 6.73 per cent of households have a shared toilet while 55 per cent have a community toilet. The highest number of households defecating in the open were found in South Delhi that accounts for 142 of the 589 surveyed clusters in the city, the highest in the nine districts of the city. Of the total surveyed households in the slums, 42.19 per cent had a bathroom on their residential premises, 21.63 per cent had it outside their premises. Just over 6.5 per cent had a community toilets while 29.62 per cent had none at all. About 21,778 households without a toilet in the South district again paint a dismal picture. The Northwest district too has 17,631 households without their own toilets. While the SFCAP deals with the all-round problems that the administration will have to tackle while making the city slum-free, it enlists a number of improvement and curative strategies to better the infrastructure and facilities available to slum dwellers. These include the existing physical infrastructure within and in the vicinity of slums and proposed relocation areas including connectivity infrastructure like road network, other transport network, water supply, sewerage, drainage, electricity and communication networks, solid waste management facilities and other physical infrastructure facilities. “Social infrastructure facilities (community toilets/baths, informal sector markets, livelihood centre, pre-schools, child care centre, schools, health centres, health, banking, community halls etc. )” also form a part of DUSIB’s curative strategy. In the course of making the SFCAP, DUSIB also gathered information based on various parameters that compose the slum population of Delhi. The data, based on which the board has created its ambitious SFCAP, stated that 65 per cent of the population in slums received tap water supplied by the Delhi Jal Board, 61 per cent used gas as cooking fuel and 96.31 per cent have electric supply in their homes. The plan also stated that “the slum dwellers in Delhi live in comparatively better ‘houses’. About 91.25 per cent live in housing which has pucca or semi-pucca structure”. The data, however, pertains to 589 surveyed JJ clusters spread across Delhi. A religious break-up of the population living in the surveyed slums shows that 80.35 per cent of the population is Hindu while 18.18 per cent is Muslim. The SFCAP reads: “The religion-wise figure reveals that most of the Muslim population resides in Northwest and Northeast district of Delhi, where 45,420 and 41,118 people are residing respectively.” The highest number of Christians are found in the Southwest and that of Sikhs is found in the Northwest. The data also shows that 123 Jains, 224 Buddhists, 185 Parsis and 6,799 persons belonging to other religions live in the slums of Delhi.